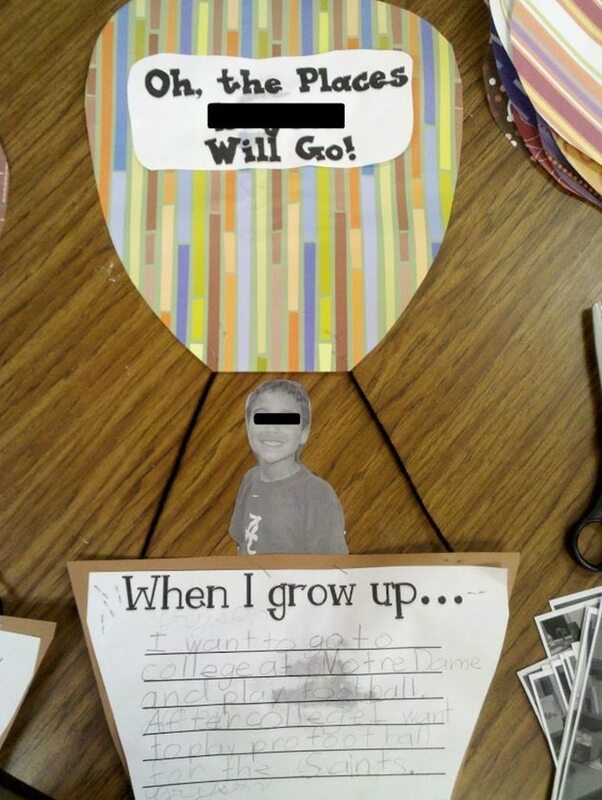 Students will write about what they want to be when they grow up on hot air balloons – which are super simple to make. These turned out SO cute! Let me share how to make these and give you a free download for the writing paper too. Cut scrapbook paper into hot air balloon shapes and let students pick their favorite pattern. Then cut a basket from brown paper. Have students write about what they want to be when they grow up. Add two pieces of string to attach the balloon to the basket and glue their writing piece onto the front of the balloon basket. For even more cuteness, add a cut out photo of each student (just their upper half) into the basket like they are riding the hot air balloon.